RDTAs have become more popular as of late, and many have been released, especially this year. RDTAs typically are genesis styled atomizers, where the deck section sits above a tank reservoir. In addition, with this style of atomizer, your cotton feeds into the tank reservoir. These are not new to the vaping world, but are now trending once more. 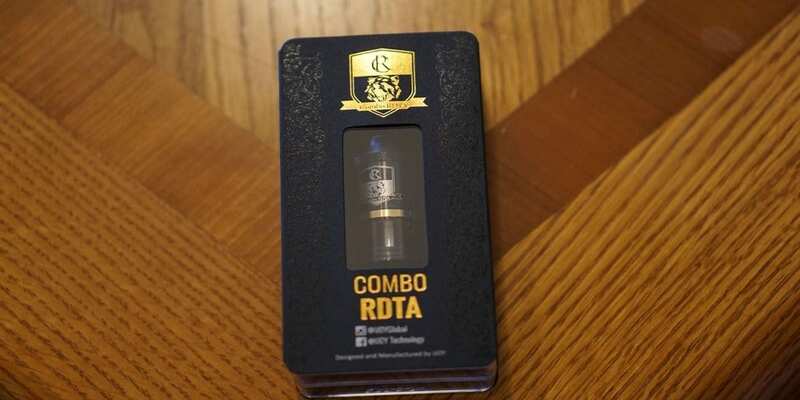 IJoy has now released their newest RDTA, the Combo RDTA. Firstly, I would like to thank Heaven Gifts for sending this atomizer my way for review. The Combo RDTA is quite unique and offers something different than all other RDTAs. 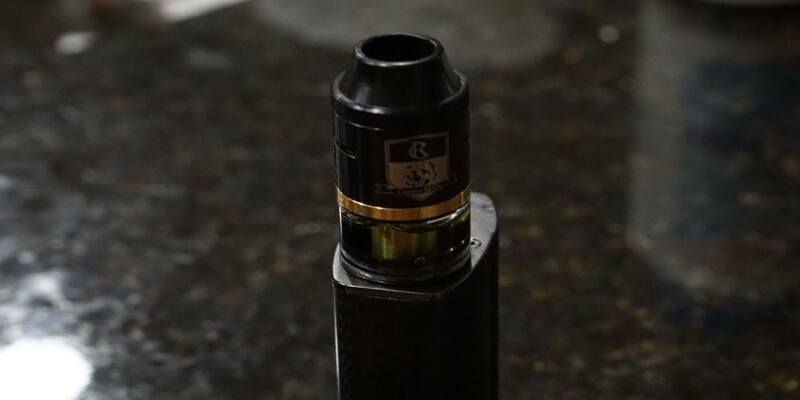 In this review, I will go over everything there is about the IJoy Combo RDTA, and tell you whether or not if I recommend it! When first receiving this product, the first thing I noticed was the packaging itself. These are typically the same type of packaging all IJoy products have, which is surely not a bad thing! The design of the packaging itself was actually very nice overall. I do like the black and gold trend the packaging had, it certainly gave it a much higher end look. 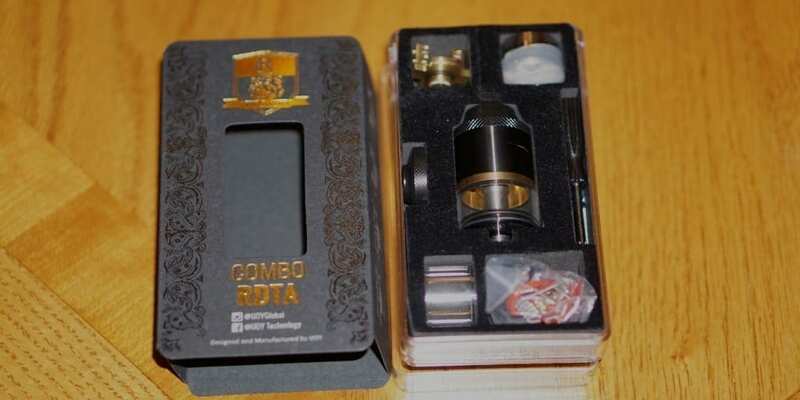 Upon first taking off the initial plastic, and sliding off the first portion of the packaging, it reveals the Combo RDTA within a plastic case. The Combo RDTA certainly looks familiar, especially if you have or used the IJoy Limitless Plus RDTA. The overall design is relatively the same as the Limitless Plus RDTA, but it does differ in some areas. For one, the color is different, and I do much prefer this color scheme over the Limitless Plus, but of course that is subjective. One of the first things I did notice was that it is slightly on the larger side. It is to be expected though as this is a 25mm in diameter atomizer. This may be a con for some people, but I know many vapers will like the size overall. What makes the IJoy Combo RDTA unique is the fact that you can swap out the build deck to other build decks that you prefer. The build deck that is already installed is a clamp styled deck, but differs from a Goon styled deck. Inside the packaging, you do receive a lot of extras. For one, right away you do see the extra deck that is included, and the pre-built coil head. This is definitely a huge pro, as they do give you something with the purchase rather than nothing. The included extra build deck that you do receive is the two post velocity styled build deck. To me, this is probably the best deck option available, so I’m certainly glad they included this one! What also makes the Combo RDTA unique is that you can transform this RDTA into an RDA. However, this specific piece is not included with this packaging, and is an additional purchase. It would of been nice if it would of came with it, but I can surely see why it did not as this does come with quite a bit of extras. I, personally did not bother to use the included pre-built coil head, as I prefer to use my own builds. However, it does look like it would work well, and it is a rather simple build rather than something like a Clapton. In addition, within the packaging you do receive a pair of fused claptons to use, which I thought was a huge pro. Many people cannot really build these fancy or exotic coils, so it was nice to have them included. Also, these type of coils are becoming standard, as some subohm tanks actually have pre-built clapton coils within a replacement coil head. Also, you do receive an extra glass tank section, which is another huge pro! You do receive a black screwdriver as well as a blue one, which I thought was a nice touch as well. Also, you do get a bag of spares with o-rings, and some other extras. Included with this RDTA is a single coil silicone adapter. I did not use this adapter, as I do prefer dual coil builds. It is a great addition though, as some people may prefer single coil builds. A 510 drip tip adapter top cap is also included, and this is another difference in comparison to the Limitless Plus RDTA, as the drip tip section screw into the barrel section. I do like this, since once screwed into place, you know it is not going anywhere. It is important to note that custom drip tips for your goon or kennedy might fit the wide bore drip tip, as mine did, which was a huge pro. However, it may look a bit off, but it is surely worth mentioning. Also, the airflow control was silky smooth, and took little to no effort to move. When in place, it does not move either, which is great. Lastly, the IJoy Combo RDTA came clean, and I did not smell nor see any machine oil. I did wash it once, and that was all it needed. This is again, a huge pro, as some atomizers come drenched in machine oil and takes forever to get it off. Overall, my first impressions of this atomizer upon taking it out of the box was great. The machining was pretty good overall, and everything was clean. Not to mention, they included a ton of extras, which is always a bonus in my book! 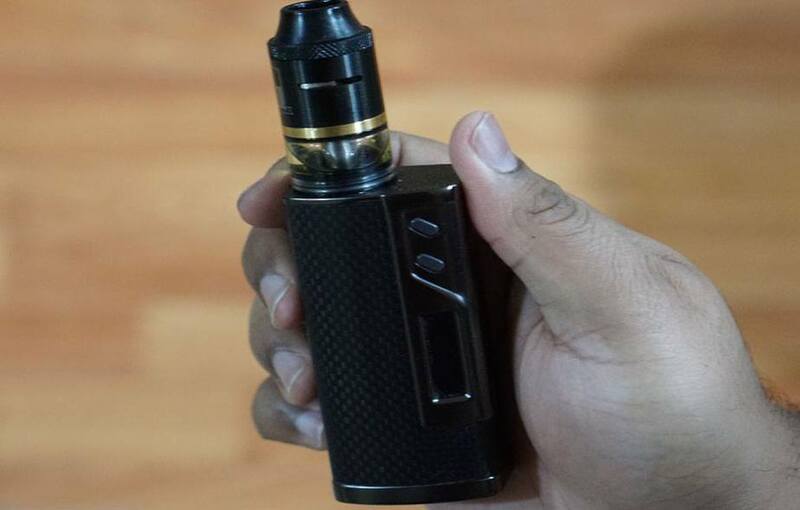 Building on this atomizer was really easy. Of course, with a velocity styled build deck you can expect this. In addition, both build decks included was extremely spacious and you could easily fit a ton of different builds in here. The clamp styled build deck was the deck I used the most as I wanted to see if it would cause any troubles in regards to installing coils and how does it compare to the velocity styled deck. For one, like said before both of these decks are easy to work with, however the velocity styled deck is much easier overall to install coils. I do love the velocity styled build deck, and glad they included it rather than having it as a separate purchase. Also, it is very easy to switch out the deck sections, all you have to do is unscrew the 510 center pin, and the deck section can be removed. This makes the entire process simple and easy. I did not run into any issues when changing the build decks. The same would apply if you wanted to use the pre-built coil head. The clamp styled build deck is fairly easy to work with, although I did have some slight issues installing thicker coils. It was not a huge deal nor was it terribly difficult, but it was more time consuming in comparison. I do like this build deck overall, but found that the velocity styled build deck is just much better. Wicking this RDTA is also very easy, and is wicked exactly the same as the Limitless Plus RDTA. Just cut the cotton by the glass section, put some e-liquid to form it into the channels, and screw on the barrel section. It is literally that simple and easy. 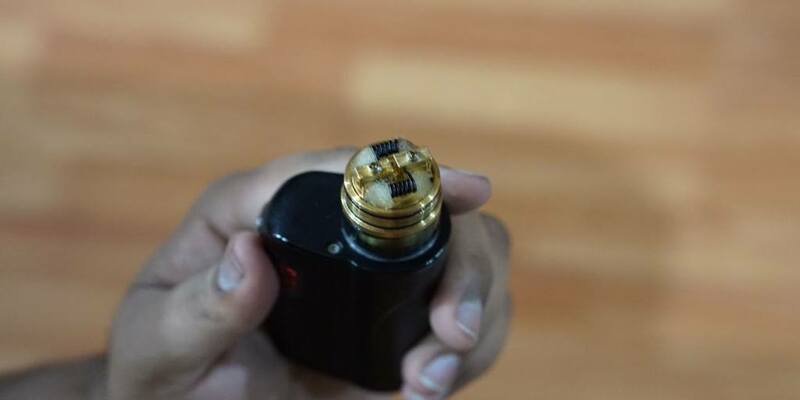 This RDTA is probably one of the easiest to wick, just like its brother, the Limitless Plus. Overall, building on the IJoy Combo RDTA is extremely easy, especially with the velocity styled build deck. Now a big question is, how does it perform? Well, this atomizer definitely performs quite well! My favorite build for this RDTA was a dual fused clapton build. The coils itself were 26GA Kanthal wrapped over with 34GA Kanthal. The resistance of this build came out to about 0.2 ohm. This build has no issues fitting at all, as there is plenty of room in this build deck. With these type of builds it is always good to know about battery safety. I recently published an article going over battery safety and covering many different aspects of it. Feel free to check out this article right here or click the link down below! I did use other builds in this RDTA, but honestly this was definitely my favorite as it took the flavor up a notch, and provided excellent vapor production. My preferred wattage for this build was right around 80w. At this wattage, I got a nice warm and satisfying vape alongside excellent vapor production. The first thing I noticed when vaping the IJoy Combo RDTA was the immense amount of airflow this had! I mean, this RDTA is definitely airy wide open, like very airy. With it wide open, it was definitely way too much airflow for me, and just cut down on the flavor and made the vapor a touch too cool for my liking. I literally had to cut the airflow down to about one third, which gave me a much more restricted draw in comparison. Also, with the airflow like this, it certainly improved on the flavor. This is, of course how I preferred to vape this atomizer, and may be different for others. Also, this RDTA gives a ton of vapor production. I was actually surprised of how much vapor the Combo RDTA can put out, it was definitely impressive. Of course, this will all be dependent on your build and wattage you are vaping. However, overall the vapor production was top notch, so if you are a cloud chaser, this is definitely something you would be interested in! Also, filling this RDTA is really easy, and basically the same as the IJoy Limitless Plus RDTA. Just be aware, if you are a chain vaper, or vape at higher wattages often, be prepared to fill this often! Like said before, the flavor was not that great with the airflow wide open, but once you cut it down a bit, it definitely improves on it a lot. The flavor is about average in my opinion, nothing out of this world. I do wish the flavor was a bit better, but it still was satisfying as the flavor was still good, but just not amazing. This could be expected though, as this is probably aimed more at people who want tons of vapor production rather than amazing flavor. I am not saying by any means the flavor is bad, it is good, but just about average. So if you are a flavor chaser, this might not be for you, however if you want excellent vapor production, then this is something definitely worth looking at. Overall, the performance of the IJoy Combo RDTA was excellent. The flavor could of been a touch better, but the vapor production was seriously impressive. However, it does have some cons worth mentioning, which we will go into next! Honestly, the IJoy Combo RDTA does not really have any major cons or anything, mostly subjective really. The first con is that the drip tip section could get a bit warm on you especially when chain vaping. This is to be expected, especially when using a Fused Clapton build or anything with multiple wires. It does not get extremely hot, but just a bit warm. Another con is that this atomizer really goes through e-liquid. I literally can drain the section section in just about an hour with the build mentioned before at about 80w. Considering the tank section is quite large, it is crazy to see how fast this atomizer can go through juice. This, of course can be the build itself, but it is worth mentioning, especially since they include a pair of Clapton coils. Another subjective con could be the 510 pin. Although it does protrude a lot, it can cause problems or issues with devices that may not have the greatest 510 connection. So, just be aware that the 510 pin is extremely long, similar to that of the IJoy Limitless Plus. However, this can certainly be seen as a pro. I did not experience any issues with my devices that I used it on, so for me, this was not an issue. A second subjective con could be all of the extras that are available. Even though this is a pro, some people may not like the fact that they have to pay extra for different pieces for this atomizer. Some may prefer an atomizer that includes everything already, so this is something certainly worth mentioning. However, I do think they give quite a lot in the packaging, but some people may still consider this a con, since everything is not included, especially the RDA section. The last subjective con could be the size of the atomizer. Many people love larger atomizers, but some people do not. This was not a con for me, but I know it may be for some people, so it is worth mentioning. Overall, the IJoy Combo RDTA does not have many cons, and mostly subjective cons. This is definitely an excellent performing RDTA, which leads me into the next section, my conclusion! In conclusion, the IJoy Combo RDTA has really impressed me. Honestly, this is probably one of, if not the best RDTA I have vaped on. I am a fan of some other RDTAs, but this one really shines, and beats the competition in many aspects. There are tons of pros to this atomizer, and most of the cons are subjective. Even though there are a ton of different deck sections not included, I do think they still gave you the best deck, which is the velocity styled deck. I do wish that the RDA section was included, as this is definitely a selling point to this RDTA, but I am still very satisfied with what came in the packaging. To me, I would easily spend the money and get the RDA section, because of how great this atomizer performs. Like said before, the flavor is not the greatest, but it is still pretty solid overall. The vapor production is definitely excellent, and certainly surprised me. So if you are a cloud chaser, and want an RDTA, this is something surely to consider. I love the fact that you can change the build deck, and even use a pre-made coil if you wanted. Wicking and building on this RDTA is simple and fast. Yes, it does guzzle e-liquid quite rapidly, but with this type of atomizer it probably is expected. What’s even better is that I experienced zero dry hits. Once you wick it correctly, which is quite easy, I am sure you will not experience any dry hits. You can turn the tank upside down as well to get it to wick, but honestly it was not really needed. I am a huge fan of the IJoy Combo RDTA, and this atomizer has definitely gotten a spot in my rotation of atomizer. Everything about this RDTA is great, and even with some of its cons, it is still a winner. All in all, the IJoy Combo RDTA is definitely an atomizer I recommend, and if you are on the fence with this one, I highly suggest giving it a shot! If you have any questions or comments, please feel free to leave them down below! Thanks for reading! I kept having to reread sentences throughout the opinion. Even after doing so, readers have to rely on general context to determine the subject of statements, temporal reference, etc Tenses are confused, modals misused, subject and verb disagree, and often the auxillary is an incorrect form of “be,”. Even more confusing, when nouns could easily be pluralized by adding “s,”, they remain singular. I’m left wondering what he’s referring to (then have to reread the section again). Even if correctly pluralized, nouns frequently don’t agree with the verb forms employed. Honestly, I am TRULY NOT trying to insult Mr Bacchus (bet Italian/Roman history was fun in High School or Freshman year). I’m aware the comment likely reads as pedantic and condescending. However, if I hadn’t specifically mentioned examples employing the correct terminology, then correction appears somewhat disingenuous as a motive. How can anyone find out how to correct a mistake easily in a search-engine-enhanced society without the right search terms? I can’t correct a grammatical mistake by using the same mistake as a search nearly as easily as typing “pluralize nouns” or “employing prepositions & prepositional phrases” in the field. AND THANK YOU for taking the time to type out the article Steve, even if you didn’t happen to have an AP Stylebook lying around. I really DID find the review helpful. For that reason, the grammatical errors and resultant confusion caused me the aforementioned frustration reading. THAT is why I comment, NOT to demean or dishearten, but to indicate area needing improvement. All the errors are simply the type that spellcheck has a hard time correcting, and only effort and/or experience make avoiding unconscious. Since you’ve begun writing relatively recently, I hope you take this comment in the fashion intended and experience effortless clarity, increased effectivity, and the disappearance of befuddlement in the future. Thanks for your comment, I will ensure that my future articles are a bit more clear. Thanks again.